Another college basketball season has come and gone, and faithful fans have watched and witnessed another March Madness that lived up to all the hype. Now we have entered the time of year when the players who were so devoutly followed will decide whether to pursue their lifelong dream of playing in the NBA – or return to college for another year. In today’s college basketball, a majority of the players making these decisions are underclassmen, most of whom are freshmen. Due to the NBA’s standards for admittance, athletes who play for one season outside the high school setting are eligible to declare for the NBA draft. With this current rule in place, a question follows: Are these freshmen physically and mentally ready for the NBA? Some players will be able to play at the level that warrants a long and successful career. But what about the players who think that they are ready, but in reality aren’t; those who are chosen later in the second round and play a few seasons in the development league? Scenarios like this give cause for the NBA to review its rules for admittance to the league and end the “One and Done” era, instead implementing a rule requiring players to attend a minimum of two years in college before declaring for the NBA draft. Joe Young played college basketball for four years. Now he has a legitimate shot at making an NBA roster. A rule change making college basketball players attend at least two years of college would primarily benefit the players. Most collegiate athletes are on campus for at least one school year taking classes, and often during the summer. However, requiring them to spend another year working towards an education puts them in a more advantageous situation for the future. If players receive high grades from NBA scouts, they can take advantage of that and enter the NBA. But if they don’t receive the high grades, the players with two years of college would have more viable options of returning to college, working on their game and at the same time continuing toward a degree. Vice versa, the current “One and Done” concept adds extra pressure on the athletes to succeed, since they have less of an alternative. Since not all players can succeed in the competitive atmosphere, it is only wise that their hard work is put toward another, more secure avenue. 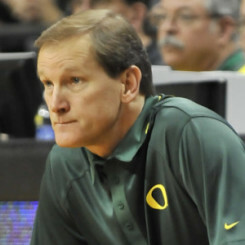 Dana Altman consistently recruits players who stay for longer than one year. 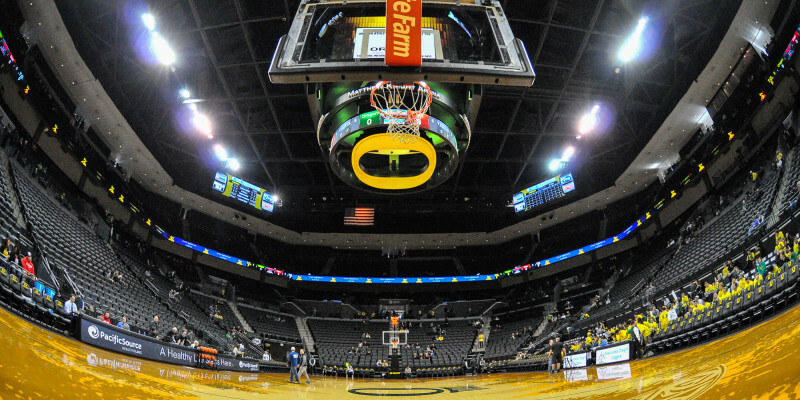 Changing the rules has specific implications for college basketball as well. During March Madness, the same top teams normally get deep into the tournament. But is this because of coaching or talent? If players had to stay for more than one year, teams like Kentucky wouldn’t be able to sign 7-8 top prospects again, and players would be more spread out. Having players spread out over more teams would allow the game to be less of a giveaway when it comes to teams contending for championships. There will always be top-tier teams, but if players are to come back for a second year, there would be a chance for more second-tier teams to develop. 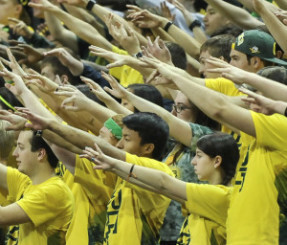 Students cheering for the Ducks. In regards to the NBA, there would be one benefit: the rule would add to the maturity of the roster. Since players would have had a second year in college, those who already had talent in their freshman year would only be more experienced in the NBA. And with a second or potentially third year hitting the college textbooks, teams with high draft picks would have a better chance of selecting players with a lasting impact. The players selected in the late first round and second round, for the most part, don’t make teams. If they do, they will play in the developmental league or opt to go overseas and play. However, they could have the option to return to college and have another year in the weight room with coaching support, before making the jump to the NBA. With the futures of players in question, it is important that the NBA not only consider the success of teams, but also the success — and futures — of players. Starting a “Two, Three and Degree” era would not only benefit players by allowing them to be physically and mentally prepared for the NBA, but it would also give them a higher likelihood of completing their degrees. And in the end, if a player’s basketball dreams came screeching to a halt, he would have set up the next forty years of his life for success.